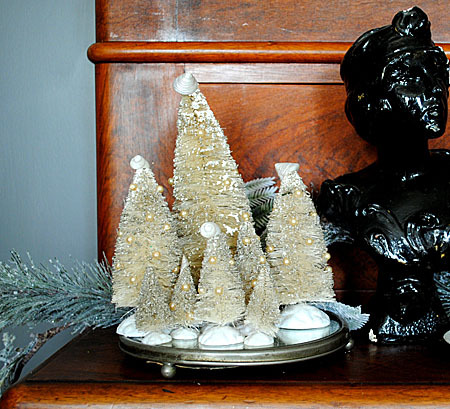 Having been an Antique Dealer for quite a few years, I have always loved old Christmas things and especially the old Wire Brush trees. The old ones can be hard to find and a bit pricey when you do find them, so I thought I would try my hand at making over some new ones. I had planned on coloring these, but I ended up liking the white ones so much, that I ended up leaving them that way and added some pearly accents to them! 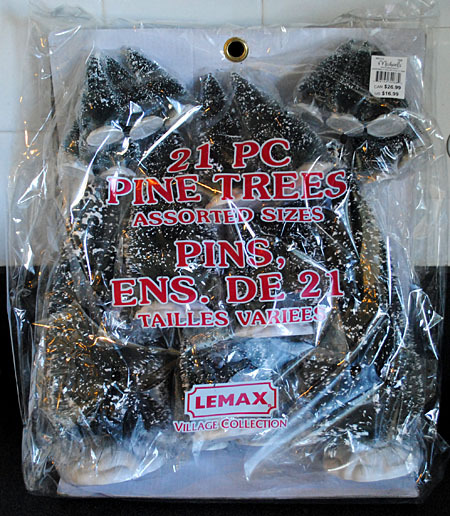 This is the pack of mixed Wire Brush trees that I picked up at Michael’s Crafts. I believe these are typically used for Train sets and such. I also saw some individual ones for sale at Walmart, so you might want to try there too. Update: A sweet reader named Deanna, just gave me a heads up that you can buy these at Home Depot for only $6.99 for a pack of 21! Woohoo! That’s a great price. Thanks for the hot tip Deanna! 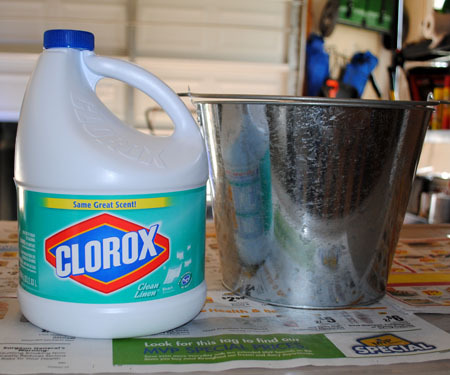 I did this project out in my garage and used a Gallon of Clorox to bleach out the green color. I just poured the Clorox into a bucket and left them to site. Just keep an eye on them so that you can pull them out as soon as they turn white. I think it was around 10 minutes or so that I left them in. The big ones didn’t fit all the way in to the pail, so I just turned them over and bleached them one end at a time. 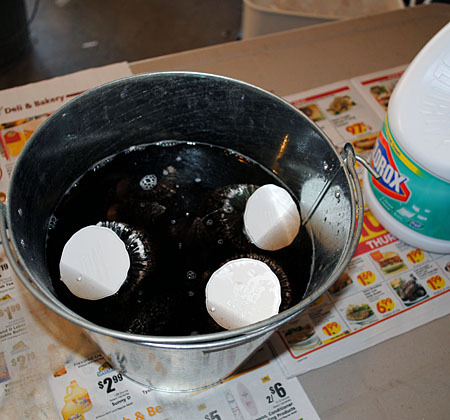 Once they’re done, just pop them into a another pail of soap water, to stop the bleach process. 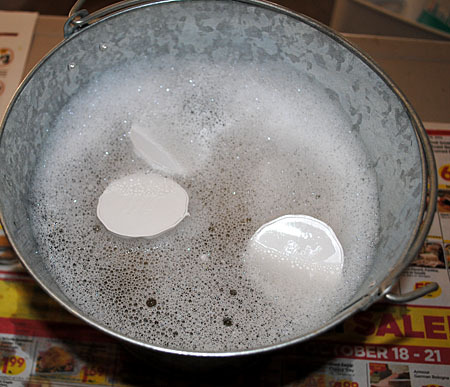 And then do a final rinse with plain water to get any soap residue off. So cute already right! Like a little blonde forest! I love that they are an off white, and not pure white, as it gives them more of a vintage look I think. Let them dry thoroughly before the next step. Next I brushed on some white glue, I think I used Mod Podge actually. And then I sprinkled on some silver glitter. I used German Glass Glitter because it looks more authentic, but you can use what you like. 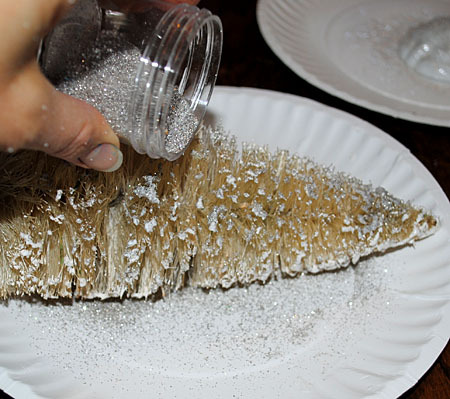 Next I applied more glue to the base and then sprinkled on some white glitter from Martha Stewart. (I found out that you can unscrew the bases and then screw them back onto the trees again). I like this glitter because it looks like Mica! After the bases dried I reattached them to the trees. Then I repurposed the beads from an old Pearl necklace, they made the perfect ornaments for my little trees! 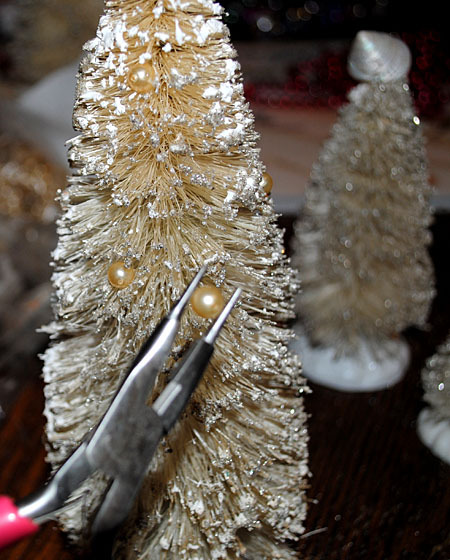 I used pliers and hot glue to attach the pearls in a random pattern to the trees. 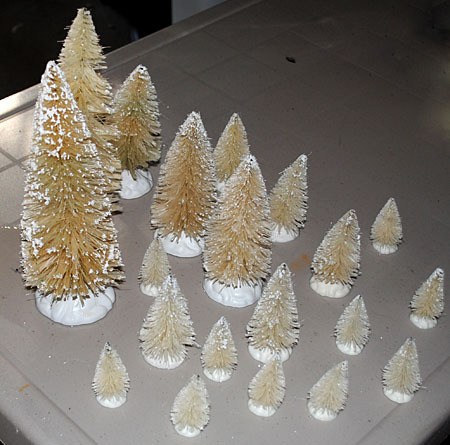 And then I added some small pearly Seashells to the tops of the trees! Cute and sparkly! They look so nice in a grouping, I placed mine on top of an antique plateau mirror. I hope you enjoyed this project! 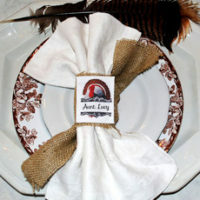 Oh they are a great addition to your Holiday decor! Magical! Thank you so much TLady!! Thanks Jeanine! And I hear ya! I bought this bag of trees last year, or it might have even been the year before, and finally made a point of doing something with them this year! I actually surprised that I could still find them in my craft room! Oh, you are awesome!! Thanks for the hot tip! I’m going to add that to my post, that’s a great price! Thanks E! Yes, do try it with straight Clorox, it took no time at all! How wonderful. I found a whole bag (16) at the thrift store. My sister has a christmas village all in white and cream. The trees are green, and they look good, but she really wanted white ones…Voila!! Now she has cream ones.T for the cool idea!! P.S. Love your website…I visit almost every day!! Thank you for these instructions! 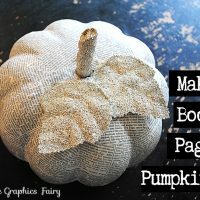 I love these and think I will simply HAVE to take time to make some. And now I know how!!! I hope you get a chance to make these Elizabeth, they really don’t take much time at all, and they’re so cute! Thank you for this tutorial! I can’t wait to try it! I just found some vintage mercury glass beads that would be cute on these trees! 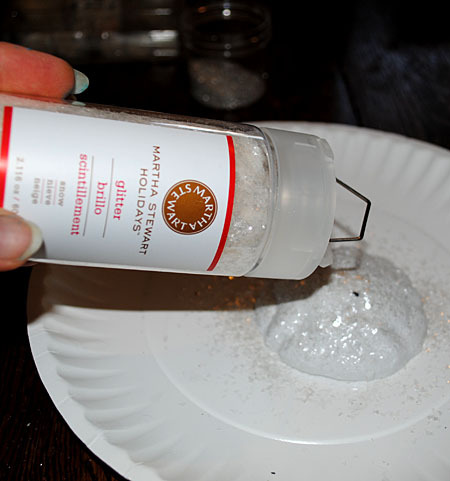 Your mercury glass beads would be perfect for this project! That’s what I planned on using originally, but I couldn’t find any, so I used the pearls instead. clorox..my goodness..i never would have thought! love the pearls as ornaments!! I had been wondering where all those typical trees came from. You don’t see them around here but they keep popping up on all thsoe wonderful blogs. Amazing that they’re just sold a whole bunch in one big bag. There’s so much you can do with these. Wish those were available here as well. Thanks Marian! Perhaps you have a hobby store in your country that sells hobby trains and accessories? That’s what these are meant for. You’re welcome Bev! I hope you can find them too, so you can try this! OK…I see a trip to HD today to pick up some trees. This is a fabulous project and I can’t wait to start my mini forest of bottle trees. Thanks for the great tutorial. You’re welcome Miss Char, thanks for your sweet comment! Karen, the trees are just fabulous. All the extra touches really made the trees pop. 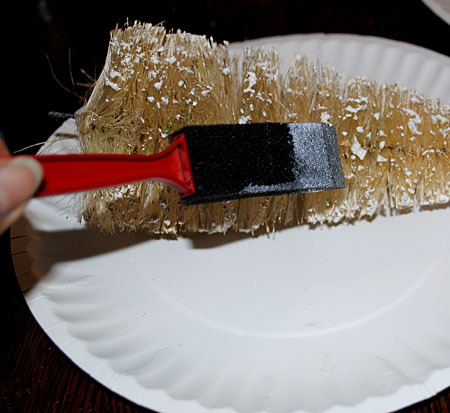 OMG I have been looking for white bottle brush trees forever! The best thing is, I have those green trees already, had no idea bleach would turn them white/cream! Definitely will be giving this a try toady! That’s awesome, I’m so glad you found this tutorial! 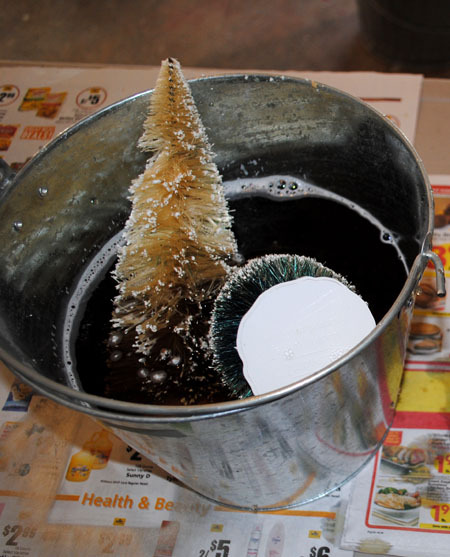 Have fun bleaching your trees! I have been using these green bottle brush trees for the past two weeks in my projects BUT I just adore your white trees. Will have to try this out with my last few trees!! Thanks for sharing Lorrie, those are adorable!! I’m totally going to do that next year! I have some of those trees just waiting to be bleached! Thanks for the tutorial….they are just beautiful! You’re welcome LeAnne! 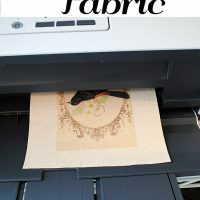 I hope you have fun with this project! Adorable, I would never have thought to bleach out the colour of these trees. I used a couple when I made snow globes and the water is now blue-green from the trees. Doesn’t look terrible, but I think I’ll try again and bleach the trees. Thanks for the post and the tips. You’re welcome Debbie! I’m glad you found this useful! Well, that is just brilliant! Thank you so much, Karen, for sharing this great idea! I have to go to HD, anyway, so I’m going to see if they still have some of those! Those are adorable. Never would have guessed what they’re made of. Thank you! It's a great idea!